I wrote a little treatise on how to write for guitar. I’m often given music that is not possible to play on the instrument, and I realize that this is because there are many people who want to write for guitar but are not sure how the guitar works. Rather than complain and curse these well meaning composers and arrangers, I decided to offer some assistance. Am I qualified? Yes. I’ve been playing and reading for a long time now and I am definitely an above average reader and player. Am I the ultimate authority on what you can write for guitar? Hell no. That person is too busy and didn’t have time to write anything, so you’re stuck with my ideas instead. Enjoy! This entry was posted in Jazz, music and tagged arranging, Chords, composition, Guitar, harmony, jazz, lessons, Music theory, patterns, theory, writing on October 18, 2016 by alexanest. I don’t usually have pedals in stock, but right now I have a Fuzz, a Compressor, and a Boost. They are all for sale so contact me if you are interested. Here they are, sitting on my workbench. 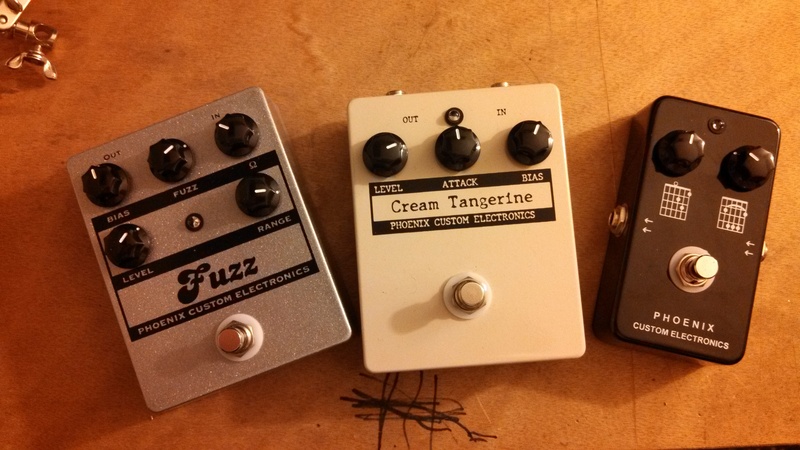 I’m nearly out of parts for the Fuzz and the Cream Tangerine Compressor and after that they will be available by special order only. This entry was posted in Stompboxes and tagged boost, Champ, Compressor, distortion, Effects unit, Face, fuzz, Germanium, Guitar, Hendrix, Knoffler, Orange Squeezer, overdrive, pedal, stompbox, True Bypass on August 18, 2013 by alexanest.